Content marketing is a wonderful way to make a living. You share openly from your heart and your head. You build an audience of people who know, like, and trust you. You make sales by making recommendations or creating a product of your own. I have both done this and had the great privilege to help others do it too for many years now. There is no doubt about it, content marketing is both fun and profitable. While many see the vision of what content marketing can be, some struggle to get started. What technology do I need to use? When I start asking clients about their own experiences and knowledge, they often freeze up. The self doubt we all feel comes rushing in like a tidal wave. The same person will talk to me for an hour about their passion but get blocked thinking that not loving to type should stop them. By the way, there is an easy solution to that problem. Just ask me sometime. Once a client says either of the above, the real fun starts for me. I say fun because it is fun to take clients on a journey of self-discovery, helping them see that what they already know is valuable. Valuable enough to blog about. Valuable enough to be able to help others. Valuable enough to bring to the marketplace. Valuable enough to make a living from blogging. 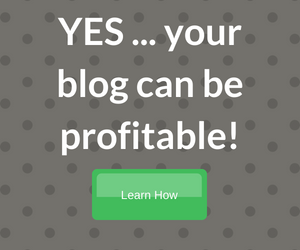 If you have ever wondered if what you know is worthy of sharing, is worthy of creating an entire blog, and entire business, about, then this article is for you. When I share what I know with clients, I do so through a short series of clarifying questions. These questions are designed to do three things. Instill in my client a sense of confidence they do not now possess. Look at what they know logically to see if it has commercial value. Help them chart a path forward should they decide to share their knowledge with the world and build a business from that process. Before we begin, let’s look at just one of many examples of ideas that most people would not find “business worthy”. A Google search, done while writing this article, shows there are 14 million sites that have something to do with this. There are over 25,000 that are specific to teaching kids to tie their shoes. There are over 16 books on Amazon alone that specifically teach parents to help kids learn to tie their shoes. To explore this topic for one second longer, let me say that the “target market” here is obviously not children. The target market is parents. And parents spend a lot on their children. In fact, the average middle-income parent will spend over $240,000 raising children. Now let’s look at the questions I ask my clients. Feel free to write down your answers. What you discover might just surprise you. QUESTION 1 - HAS WHAT YOU KNOW HELPED YOU? This is an important question because we naturally want to promote ideas that have helped us. We are passionate about what really works in our lives. If something brings transformation on any level, if it helps us go from where we are now to where we want to be, we are passionate about it! Let’s say you need to lose 20 pounds. You sacrifice, starve yourself, and do 100 other things to lose the weight. But the scale won’t budge. Then you learn about a new program that looks like it will work. You try it and get some results. Then you lean in and really commit. Now you are on your way! And before long, the 20 extra pounds are history. Getting the person who had this experience to NOT talk about it is going to be a challenge! That person is happy. They have had true results. And their natural instinct is to become an evangelist for that program. So starting with whether the knowledge you have has helped you is the right starting point. By the way, the answer to this question is almost always yes. After all, people don’t stay with things that do not work. QUESTION 2 - CAN WHAT YOU KNOW HELP OTHERS? This is a vital question for three reasons. Most people will help another person given the chance. Other people need help, they want change. The essence of all content marketing is wanting to help others. While humans can, and do, have all sorts of negative traits, the fact remains that most people will help others in need. And that is the essence of content marketing. Sure, there are companies that do content marketing for purely financial reasons. That’s business. But the fact remains that the vast majority of content is provided by small businesses and individuals who want to share. They share from passion and a desire to make profit. And there is nothing wrong with that. In fact, there is everything right about it! QUESTION 3 - HOW DID YOU ACQUIRE THE KNOWLEDGE? Why does it matter how you acquired the knowledge? Years ago, my mother needed open heart surgery. While all open heart surgery is serious, this was going to be a quadruple bypass. And it was many years ago when that surgery was not quite as common as it is now. When it came time to choose the doctor, we had some choices. The fresh faced recent graduate who was at the top of his class. The surgeon who had been practicing for 10 years and had done thousands of procedures just like the one mom needed. Enough said. Sold. You got the job. Thankfully, the choice was a right one and she made a full recovery. So why do I tell this story to clients? To emphasize the point that experience is valuable. Theoretical knowledge gained from watching and reading is good … practical knowledge gained by experience is marketable. I’ve seen this in my own life. I can talk with a client for only a few minutes and have a sense of whether their product, idea, or experience, is marketable. That comes only from having done this so long, and having had about 4000 one-to-one calls with members and clients. Your experience is valuable. And the odds are there is a brisk market of people who not only need what you know … they will pay for it. QUESTION 4 - ARE OTHERS SELLING INFORMATION ABOUT THIS? Here’s a funny fact. No one wants to go first. Everyone wants a sure thing. This is how humans are made. And it only makes sense to have a reasonable assurance that what you know will find an audience and be bankable. So how do you find that out without doing weeks of deep research? Are other people making money selling this type of information? If you Google your topic, from ant farming to zebra grooming, you will likely find products and information being sold right now. And yes, people are selling ant farming products. Take a look. While a thorough product/market match takes more than one question, the point is this … there is a market for almost anything. Some years back a client came to me with a bread recipe. It was a healthy bread, being marketed long before anyone was talking about carbs or gluten or celiac disease. I asked the same questions I am sharing with you today, did a market analysis (as I do for all clients) and we decided to move ahead. He sold $4000 worth of a recipe delivered by email in the first month. We then went on to bundle the ingredients needed to bake the bread (bundles are great sellers) and began nurturing his now-growing list with content. The rest of the story is that his business prospered because he became convinced that what he knew - this "odd little recipe" as he called it - had value. QUESTION 5 - ARE YOUR GOALS REASONABLE? The bane of my existence, the one thing I like least about doing business online, are the get rich quick schemes. One by one they come, promising no-effort riches. They grow quickly and people jump in from fear of missing out and easy money. And then they fall, leaving behind broken dreams, empty bank accounts, and hurting people. I’ve seen this many times, including very recently. So I always ask clients about their goals. Many times, clients have goals that are perfectly reasonable but their timetable for achieving it is a little off. Other times clients have been poisoned by the get-rich-quick crowd and just can’t get traction until they give up the illusion. Here is what I tell clients … almost anything can be achieved with hard work and good planning. But it’s hard to know if what you have, and want to do, is achievable without having deep experience. So if in doubt, don’t quit but instead ask someone who will give you an honest evaluation. QUESTION 6 - WILL SHARING THIS INFORMATION MAKE YOU HAPPY? You are going to spend considerable time on whatever you do for a living. That time can be a joy or a drudge. Just recently, I spoke with a client who clearly has a passion for baking. When we talked about what her business might be like, she was confused and unsure as long as we talking about “Internet marketing”. But when we talked about baking her voice lifted and her passion became obvious. She also has the skill because she told me she has never had a complaint from her paying customers. You see, she bakes part time now and sells what she bakes. But that is tiring and she wants to leverage her knowledge to gain more free time and more money too. She is perfectly positioned to do well, and I will do everything in my power to help her do that. But not with Internet marketing. Because Internet marketing (my passion) is not her passion by a long shot. And that means that talking about, writing about, and doing Internet marketing is going to become a job to her. And she has a job now. Does the area where you have knowledge now make you happy? Do you work for money but love to talk about golf, or bowling, or fishing, or knitting, or lean manufacturing, or homeschooling kids? Would you love to be able to make money from the area that you really love? If you answered yes, look at the questions again. The odds are very much in your favor now and you likely have a reason to start a content marketing business. Well, now you have my list. These are the questions I ask consulting clients every day. The answers to these questions can bring clarity, a sense of optimism, and help you know whether exploring an online business of your own makes sense. Here’s my final word - I am blessed to make my living doing what I love. I have done so for over 17 years now. 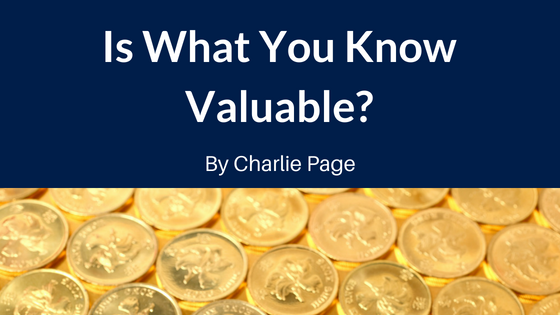 I can tell you that it is worth the time and money to determine if what you already know, and love, can be monetized into a business of your own. Because having a business doing what you love, especially when you help others as part of that business is truly a beautiful thing indeed! A very encouraging article…thank you. I have been working slowly but consistently since our conversation a few days ago. What a steep learning curve but the accomplishments, however small, are very satisfying.